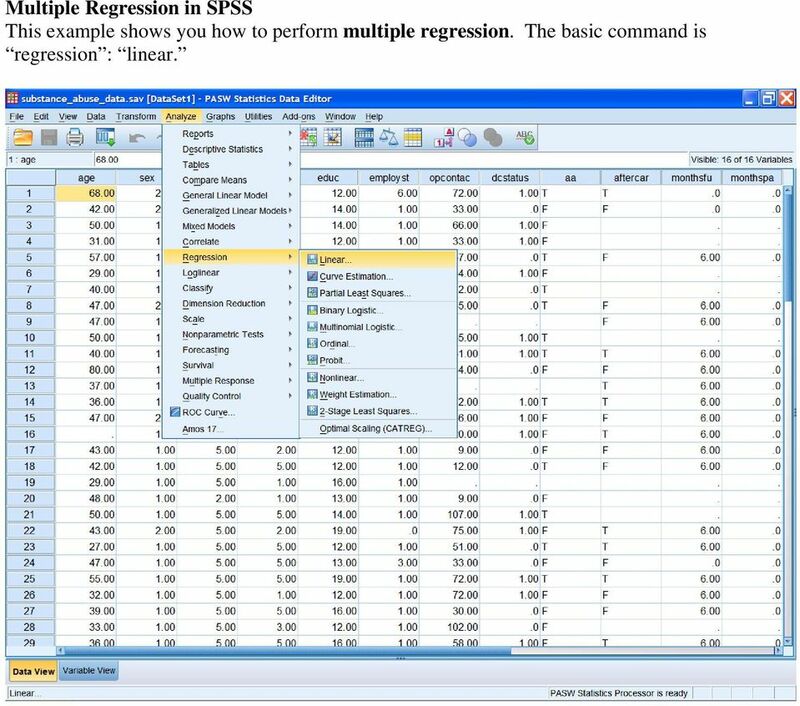 Download "Multiple Regression in SPSS This example shows you how to perform multiple regression. The basic command is regression : linear." 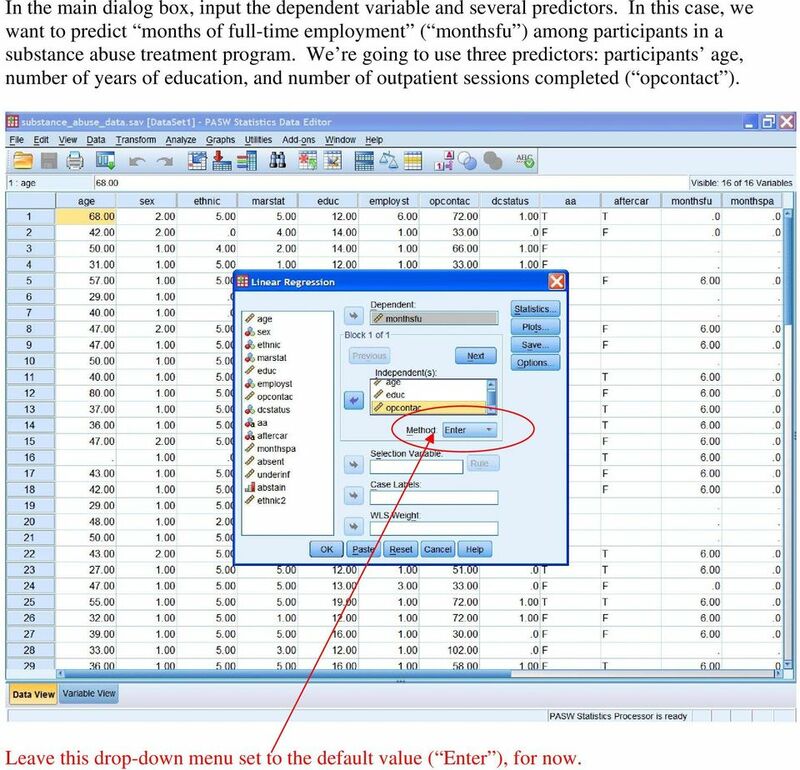 1 Multiple Regression in SPSS This example shows you how to perform multiple regression. The basic command is regression : linear. 2 In the main dialog box, input the dependent variable and several predictors. In this case, we want to predict months of full-time employment ( monthsfu ) among participants in a substance abuse treatment program. We re going to use three predictors: participants age, number of years of education, and number of outpatient sessions completed ( opcontact ). Leave this drop-down menu set to the default value ( Enter ), for now. 3 Click on the Statistics button to view this dialog box. 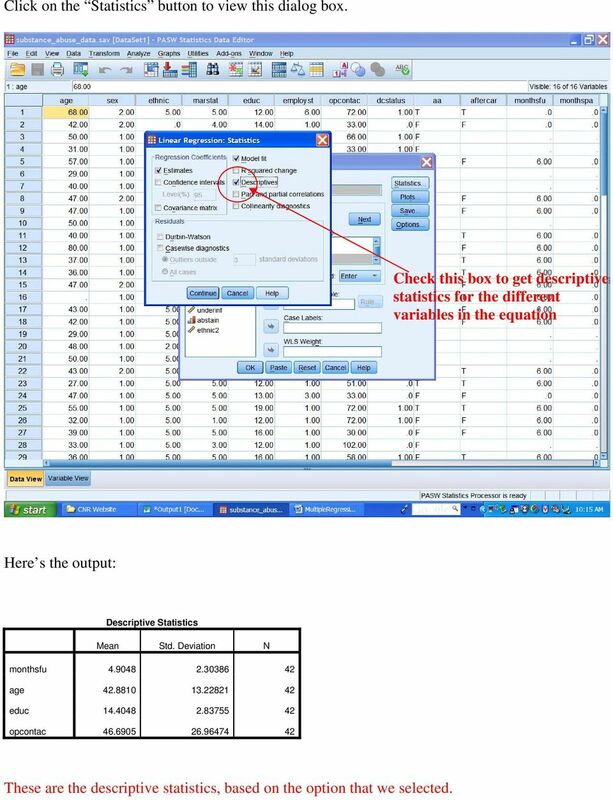 Check this box to get descriptive statistics for the different variables in the equation Here s the output: Descriptive Statistics Mean Std. Deviation N monthsfu age educ opcontac These are the descriptive statistics, based on the option that we selected. 4 Correlations monthsfu age educ opcontac Pearson Correlation monthsfu age educ opcontac Sig. (1-tailed) monthsfu age educ opcontac N monthsfu age educ opcontac The descriptives command also gives you a correlation matrix, showing you the Pearson rs between the variables (in the top part of this table). Summary R Std. 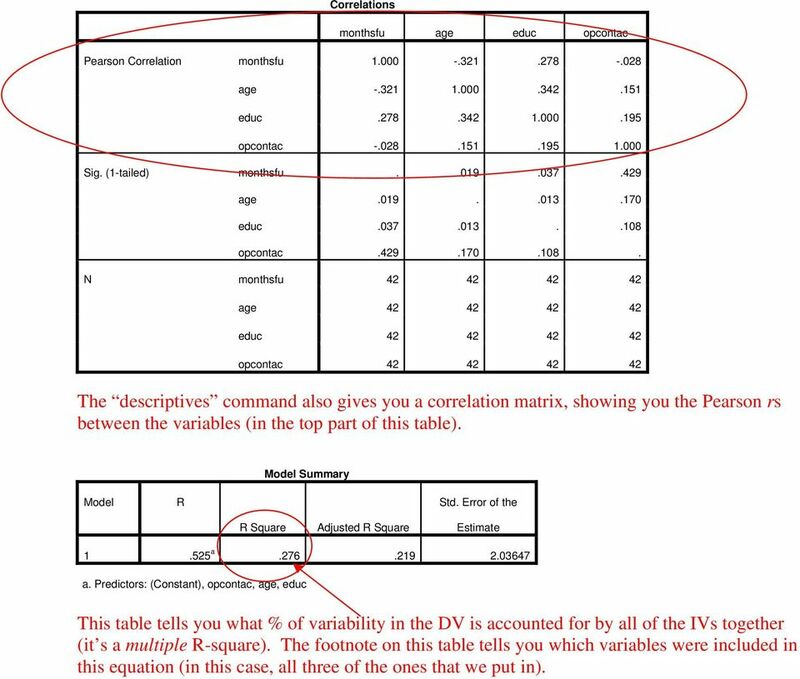 Error of the R Square Adjusted R Square Estimate a a. Predictors: (Constant), opcontac, age, educ This table tells you what % of variability in the DV is accounted for by all of the IVs together (it s a multiple R-square). The footnote on this table tells you which variables were included in this equation (in this case, all three of the ones that we put in). 5 ANOVA b Sum of Squares df Mean Square F Sig. 1 Regression a Residual Total a. Predictors: (Constant), opcontac, age, educ b. 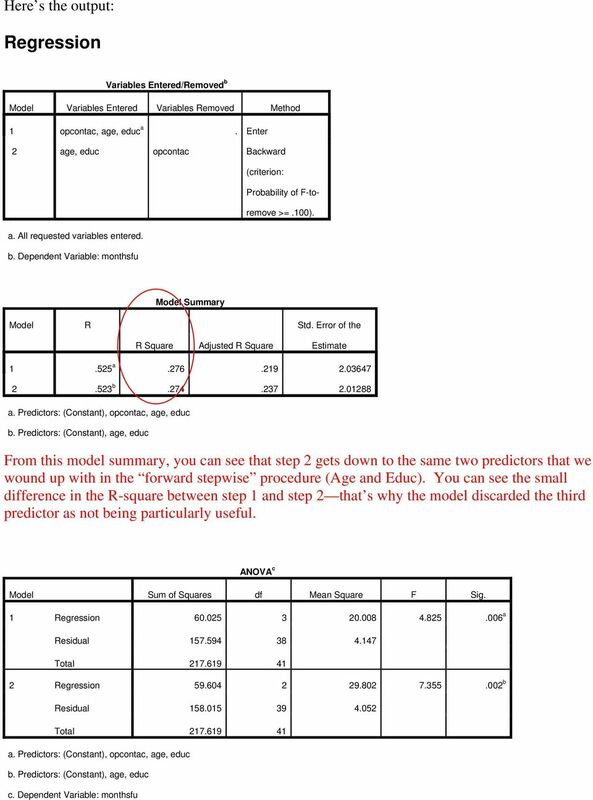 Dependent Variable: monthsfu This table gives you an F-test to determine whether the model is a good fit for the data. According to this p-value, it is. 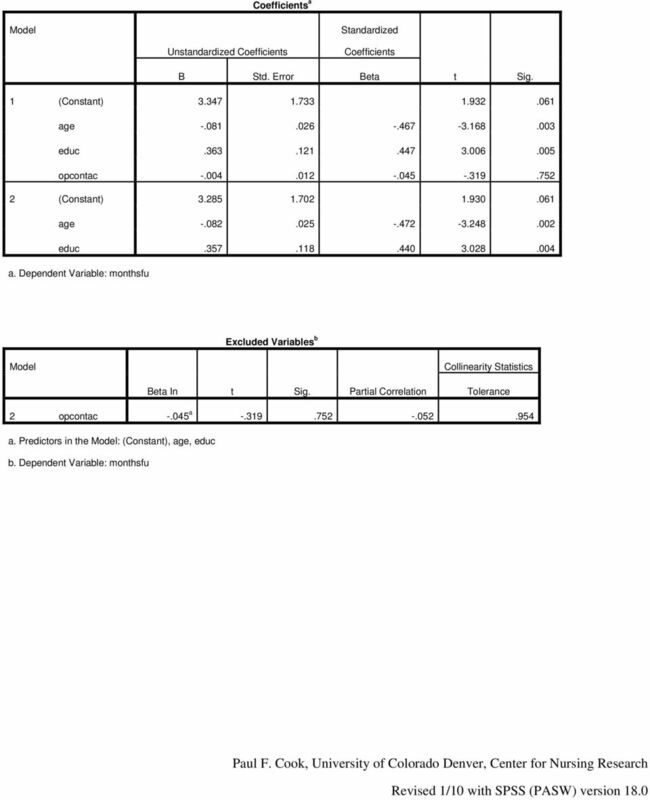 Coefficients a Standardized Unstandardized Coefficients Coefficients B Std. Error Beta t Sig. 1 (Constant) age educ opcontac a. Dependent Variable: monthsfu Finally, here are the beta coefficients one to go with each predictor. (Use the unstandardized coefficients, because the constant [beta zero] is included). Based on this table, the equation for the regression line is: y = (age) +.363(educ) -.004(opcontact) Using this equation, given values for age, educ, and opcontact, you can come up with a prediction for the months of full-time work variable. 7 Here s the revised output: Variables Entered/Removed a Variables Entered Variables Removed Method 1 age. Stepwise (Criteria: Probability-of-F-toenter <=.050, Probability-of-F-toremove >=.100). 2 educ. Stepwise (Criteria: Probability-of-F-toenter <=.050, Probability-of-F-toremove >=.100). a. 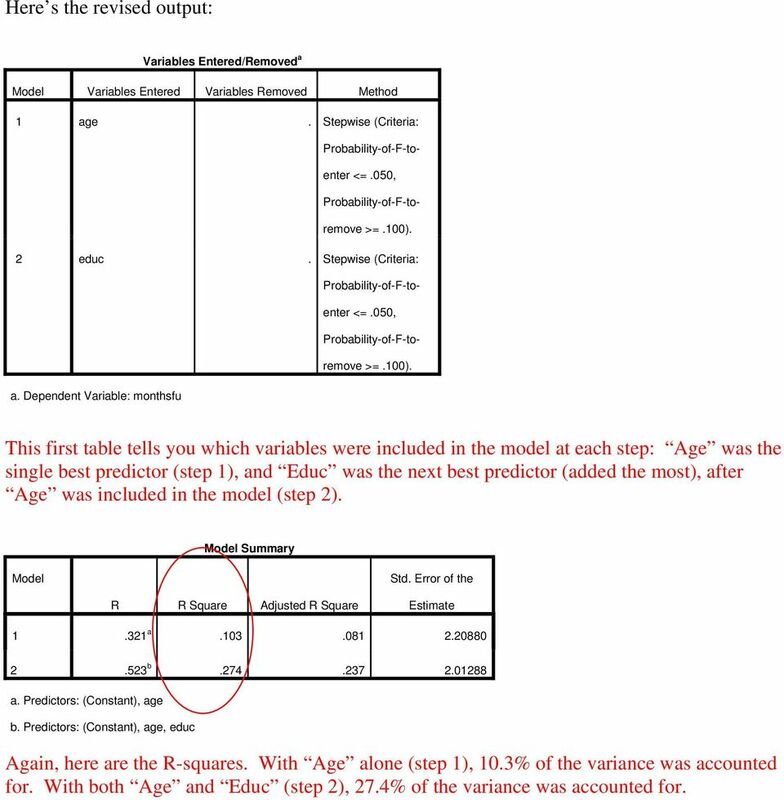 Dependent Variable: monthsfu This first table tells you which variables were included in the model at each step: Age was the single best predictor (step 1), and Educ was the next best predictor (added the most), after Age was included in the model (step 2). Summary Std. Error of the R R Square Adjusted R Square Estimate a b a. Predictors: (Constant), age b. Predictors: (Constant), age, educ Again, here are the R-squares. With Age alone (step 1), 10.3% of the variance was accounted for. With both Age and Educ (step 2), 27.4% of the variance was accounted for. 8 ANOVA c Sum of Squares df Mean Square F Sig. 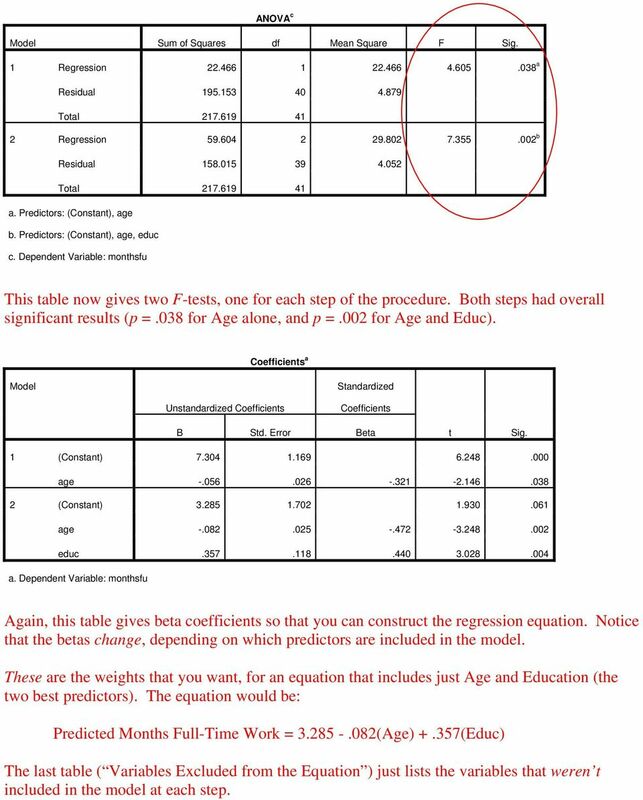 1 Regression a Residual Total Regression b Residual Total a. Predictors: (Constant), age b. Predictors: (Constant), age, educ c. Dependent Variable: monthsfu This table now gives two F-tests, one for each step of the procedure. Both steps had overall significant results (p =.038 for Age alone, and p =.002 for Age and Educ). Coefficients a Standardized Unstandardized Coefficients Coefficients B Std. Error Beta t Sig. 1 (Constant) age (Constant) age educ a. 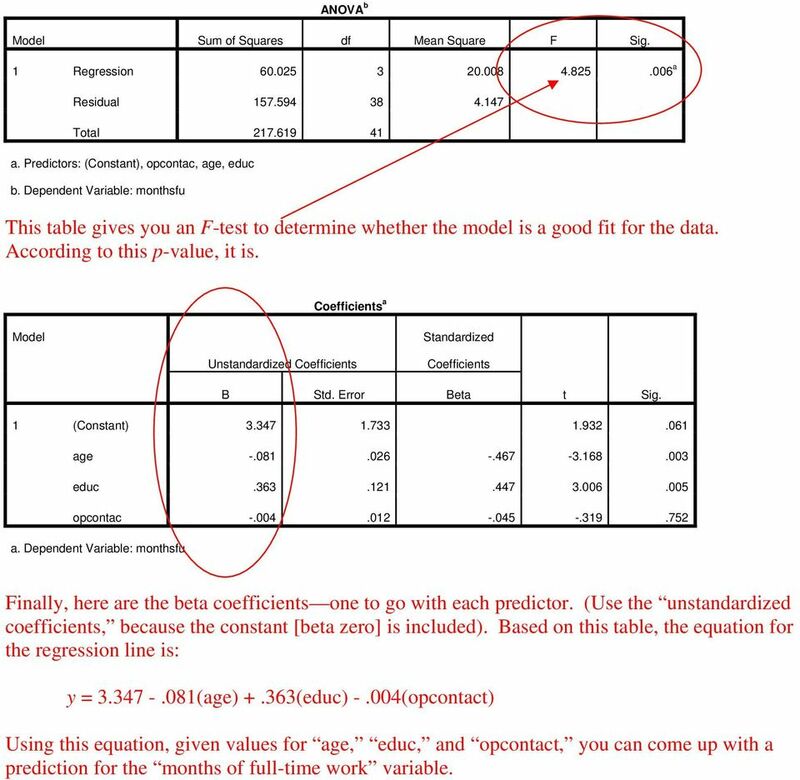 Dependent Variable: monthsfu Again, this table gives beta coefficients so that you can construct the regression equation. Notice that the betas change, depending on which predictors are included in the model. These are the weights that you want, for an equation that includes just Age and Education (the two best predictors). The equation would be: Predicted Months Full-Time Work = (Age) +.357(Educ) The last table ( Variables Excluded from the Equation ) just lists the variables that weren t included in the model at each step. 9 Finally, try the backward stepwise regression procedure. 1.1. Simple Regression in Excel (Excel 2010). 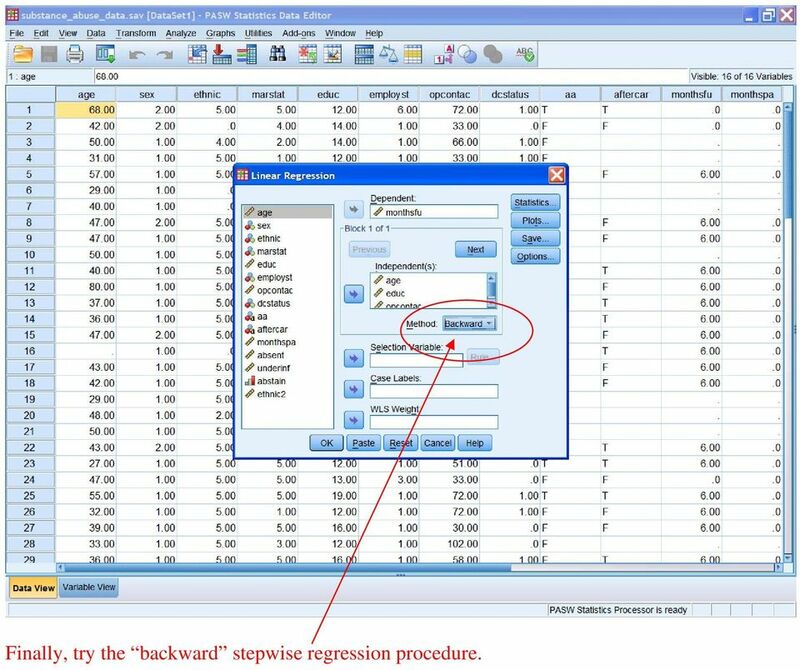 Dale Berger SPSS Step-by-Step Regression Introduction: MRC01 This step-by-step example shows how to enter data into SPSS and conduct a simple regression analysis to develop an equation to predict from. 1 Simple Linear Regression, Scatterplots, and Bivariate Correlation This section covers procedures for testing the association between two continuous variables using the SPSS Regression and Correlate analyses. Chapter 311 Introduction Often, theory and experience give only general direction as to which of a pool of candidate variables (including transformed variables) should be included in the regression model. 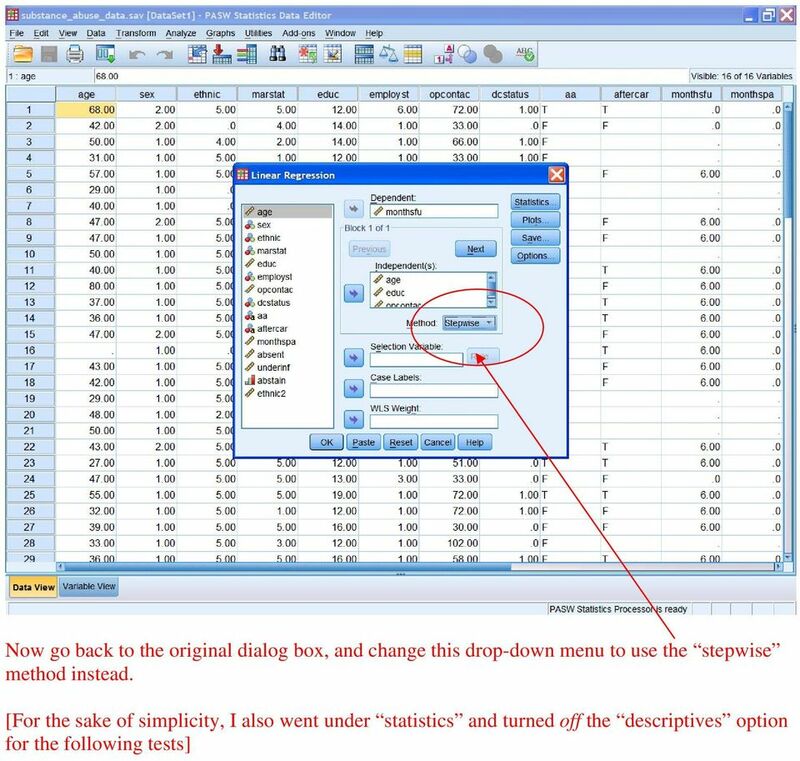 There are six different windows that can be opened when using SPSS. The following will give a description of each of them. Multiple Regression: What Is It?